The Earth’s Atmosphere has changed over time. “There is still much work to be done to stop global warming and its resulting effects–the possible mass extinction of many of Earth’s species!”! November 27, 2015—When the subject of climate change or global warming comes up people immediately think of what is happening around us now. The time in which we live is not typical of past conditions. Neither the climatic environment nor current living organisms are typical of those in the past. 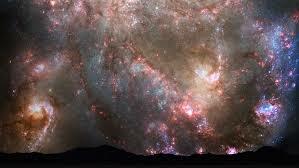 The earth was formed approximately 4.6 billion years ago. Not much is known about the early history of the planet because little evidence remains of this time period, but geologists have divided the history of the Earth into four time periods called eras. They are the Precambrian, Paleozoic, Mesozoic and Cenozoic. Each of these eras were unique in many ways, including climate and the life forms that were dominate. Each boundary between eras created a point in time when there was a drastic change in the global environment. The earliest, and longest, geological era is the Precambrian which spans 88% of Earth’s history, approximately four billion years. Most of us have difficulty in comprehending such a long period time! 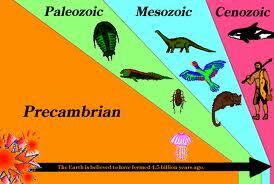 If we consider the age of the earth on a scale of a single year, the Precambrian Era covers the first 321 days. Using this scale this places the end of the Precambrian Era in mid-November. Evidence of what took place on the planet in the Precambrian is skimpy but today we know some of the most important events. During this long span of time Earth changed drastically. In the beginning it was a hot molten mass without atmosphere, ocean, or land. It was only after a long time that the mass cooled enough for the solid crust to form. As the Earth cooled and a solid crust formed, gases such as water vapor, carbon dioxide, and nitrogen formed. It may have had a composition of 60-70% water vapor, 10-15% carbon dioxide, and 8-10% nitrogen. Temperatures near the surface were much higher then than now being in the range of 85-110oC (185-230o F). By 3.8 billion years ago, continued cooling caused the water vapor to condense, clouds to form, and frequent, intense, and widespread rain to occur. The large amount of water vapor in the atmosphere must have caused rains that went on continuously for thousands of years. Eventually the ocean basins filled with water. Water began to cycle through the environment as it changed from liquid in the ocean to gas in the atmosphere and back to liquid precipitation again. By 3.5 billion years ago the distribution of water was pretty much the same as today. Sea levels were similar to that of recent times. Mass extinction could happen again-do we care? 1. All the chemical elements essential to life were present before life appeared and were present in sea water. Early forms of life were bacteria that thrived in a carbon dioxide rich environment. 2. The next step in the process of evolution was the development of organisms capable of photosynthesis. Photosynthesis removes carbon dioxide from the atmosphere. The process takes carbon dioxide and water, and in the presence of sunlight, produces oxygen. 3. Between three and a half and four billion years ago crude forms of algae appeared. They were oxygen-producing bacteria that lived in an oxygen-poor environment. These oxygen producers began to change the atmosphere from carbon-rich to oxygen rich. Throughout most of the history of the Earth, the planet has been much warmer than it is today. There have been times however, when the climate became much cooler than now. At times the atmosphere got cold enough for massive amounts of ice to develop on the surface. Such periods are known as ice ages. The earliest ice age took place two billion years ago. A second ice age took place from 800 to 600 million years ago and was more widespread than the previous one. Ice collected first in the Arctic and Antarctic regions and then expanded outward. The glaciers repeatedly scoured the continents, creating what was possibly the most extensive glaciation period ever to occur on our planet. This glaciation period also correlates with the boundary between the Precambrian Era and the Paleozoic Era approximately 750 million years ago. The climate changes, which took place during the Precambrian Era, were massive and dwarfed the climate changes taking place today. The Precambrian Era also resulted in mass extinctions. However, environmental changes are now taking place so rapidly that some scientists predict these changes will lead to another mass extinction. Some studies indicate that more than half of all species that existed since humankind first appeared on the planet are already extinct. If this is the case than we are indeed may be responsible for another mass extinction. There is still much work to be done to stop global warming and the resulting effects–possible mass extinction of many of Earth’s species! Categories: Climate Change, Extreme weather, Global warming and its effects on animal population | Tags: Climate change, Co2 and Global Warming, Mass extinction | Permalink.